Taking our cue from Italo Calvino and his Invisible Cities, where the human imagination is not necessarily limited by the laws of physics or the limitations of modern urban theory, we have set up a room for wonder. In the book, Marco Polo and Kublai Khan do not speak the same language. When Polo is describing the various cities, he uses objects from the city to tell the story. The implication is that each character understands the other through their own interpretation of what each are saying. Similarly, in this exhibition we present a series of ‘objects’ or clues that form a framework and give you tools to position yourself physically, without setting a literal narrative. This space has no pre-supposed history, and every future one could imagine. We have constructed a sculptural interruption in the gallery. Not prescriptively, but referencing a route across Belfast, this sculpture is the basis for you to create any urban space, actual or fictitious, imagined and imaginable. Within the environment of the suspended spot lit sculpture, and with certain tools; altitude, compass points and references to the north star, to help you orientate yourself, the participant will navigate their way through the gallery’s spaces, encountering golden texts pulled from Calvino’s Imagined Cities along the way. The evocative texts serve as a reminder to suspend your everyday perception of reality, disregard your knowledge of what a city’s limitations are, and create for yourself fantastical urban spaces. During the opening event, the vocalist Úna Lee will perform two ten minute ‘songs’ referencing the texts on the wall and assisting in creating a space to aid your imagination. Curated by PLACE in collaboration with Golden Thread Gallery, this exhibition follows the line connecting east and west Belfast. It interrupts the gallery as we travel around, under, over and through. 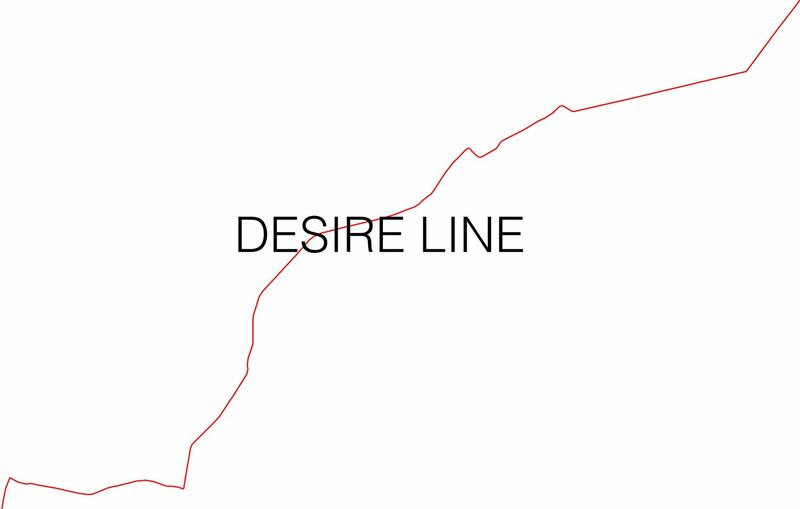 Programmed as part of City as a Gallery, Desire Line plays with the poetic and anecdotal elements of Belfast’s visual culture referenced along this route.